According to the National Sleep Foundation, nearly 40 million American men and women suffer from sleep disorders. However, sleep problems affect more women than men. I have suffered from insomnia for many years. When I was in college, before I had five kids, I noticed that it was taking me longer to get to sleep than years past. Back then I would lie in bed awake for about a half an hour before falling asleep. Today that half an hour has turned into 2-3 hours. 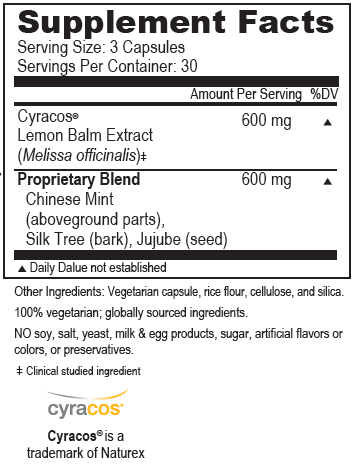 My doctor prescribed trazodone for my insomnia, but sometimes I need to complement it with melatonin or another natural supplement for sleep. Now that school is well under way, my stress levels have increased and it is even harder to get to sleep at night. 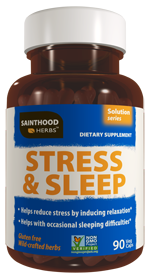 Sainthood Herbs offers an all-natural supplement called Stress & Sleep designed for women just like myself who need a little extra to help to unwind and get a better night’s sleep. holidays and weekends. This consistency helps your body become accustomed to defined sleep-wake cycles. The only footnote here is that if you don’t fall asleep within 15 minutes, consider getting up and doing something low key and try again in a bit. This can be easier said than done if you have a to-do list that’s a mile long. Look for practical ways to be more organized by establishing priorities and delegating when possible. If anxiety is still keeping you awake at night, consider a supplement like Stress & Sleep from Sainthood Herbs™ to help bring things down a notch. Tell your body it’s time to rest by creating personal sleep cues. Taking a warm bath, reading or listening to relaxing music are all good ways to bridge the gap between a hectic day’s activities and the time for bed. Just like the footie pajamas that keep kids cozy overnight, adults need things that are soothing and comforting to promote optimal sleep. Many women consider a room that’s cool, dark and quiet to be ideal even if just a quick trip to the bathroom for those moms of tots. Things like a white noise machine or a clock with nature sounds to create an environment may be just right for some women. Make sure your mattress and pillow are also giving you the support you need as well. Nothing like a comfy bed. Getting regular physical activity can help one fall asleep, as long as the timing is right. Exercising too close to bedtime can act as a stimulant, so make sure your workout takes place early enough in the day to be helpful. You probably have some tricks of your own to add to our list like meditating, or sitting in the massage chair or drinking a glass of warm milk….whatever you do, try and keep it healthy. And if a woman or busy mother is looking for healthy supplements that address other issues, Sainthood Herbs™ offers a full line of natural herbs targeting Heart & LDL, Blood & Glucose, Menopause, Weight Management, Urinary Tract, Mental Agility and, of course….Stress & Sleep! Now that I have been taking Stress & Sleep before bed, the time it takes me to fall asleep is gradually getting shorter. When I get 7-8 hours of sleep at night I have more energy and my mind is a lot sharper. 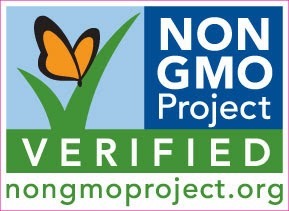 For more information on Sainthood Herbs full line of preventative supplements for women visit sainthoodherbs.com. *Disclosure: I received a bottle of Stress & Sleep from Sainthood Herbs in exchange for this review. All opinions are accurate and 100% mine.